No visit to Greece would be complete without a tour of Delphi. Surrounded by incredible natural beauty, this UNESCO designated World Heritage Site is one of the most important archaeological sites in Greece. At the foot of Mount Parnassos, within the twin rocks of the Phaedriades, lies the Pan-Hellenic sanctuary of Delphi, which was the site of the most famous oracle of ancient Greece. Delphi was regarded as the center of Ancient World – the “Omphalos” (Navel of Earth). According to mythology, this is the place where the two eagles sent by Zeus from the end of the universe to find the center of Mother Hearth (Gaia), met.Â According to myths, Delphi became the major site for the worship of Apollo after the god killed Python, described as a dragon who protected the navel of the Earth. After that, Apollo- in the shape of a dolphin â€“ carried on his back priests from Crete to Kirrha (the port of Delphi) in order to build his sanctuary. This myth survived in plays presented during the various Delphic festivals, such as the Septerion, the Delphinia, the Thargelia, the Theophania and, of course the famous Pythian games, which celebrated the death of Python and included musical and athletic competitions. The priestess of the oracle at Delphi was known as Pythia, who-possessed by Apollo himself â€“ prophesied in a state of trance. Delphi, with a population of 1.500 inhabitants, is one of the most beautiful and impressing landscapes of Greece. It was already inhabited in the prehistoric times and later, especially during the classic times, obtained great historic importance, as it has been linked with the most significant events of Greek history. Today the visitor can admire various interesting architectural monuments such as the stadium (the best preserved stadium of antiquity), the Dorian Temple of Apollo (4th century BC), a theater for 5,000 spectators, the Treasures of the Athenians and the Museum of Delphi (one of the richest museums of the world). The new city of Delphi, which was transferred a km western, after the excavations in 1892, is characterized by a modern infrastructure: the European Cultural Center of Delphi which aims at reviving Delphi as a European and international cultural center with global activities. 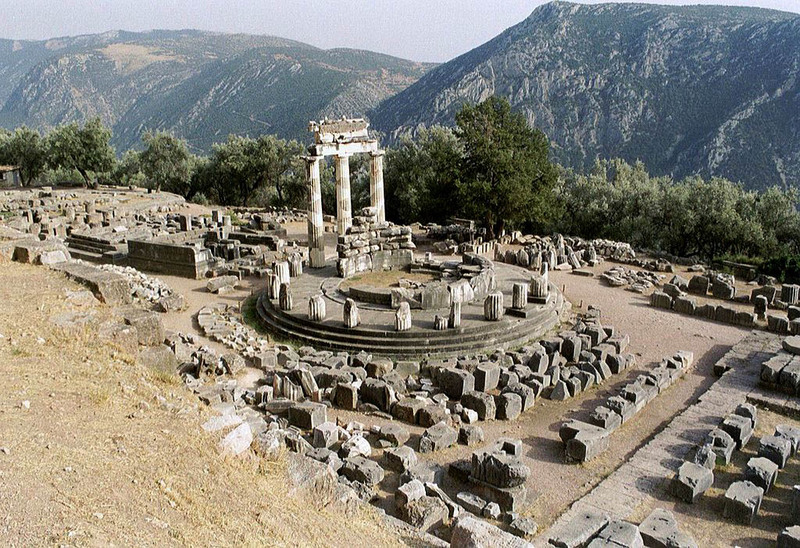 Delphi is among the most interesting ancient sites in the country and apart from sightseeing, things to do in Delphi include cycling and trekking in the region. The temple of Apollo was the center of Delphi. This temple would host a stone called the navel of the Earth. Under this temple was the famous oracle of Delphi. The location of the Ancient Theatre of Delphi offers breathtaking view to the surrounding mountains. Restoration works are continued there, which is why this theatre rarely hosts events today. The Sanctuary of Athena Pronea, also known as Tholos, was the first temple the pilgrims arriving in Delphi could spot. The goddess of Athena Pronea was considered the protector of Pythia. The ancient stadium of Delphi is found on top of the hill, surrounded by lush trees. This is where the famous Pythian Games would take place in the antiquity. The Archaeological Museum of Delphi hosts exhibits from excavations at the sanctuary. Most famous exhibits are the Sphinx of Naxos and the Charioteer. Although many parts are missing, the Charioteer of Delphi is a masterpiece of ancient Greek art. This is a bronze statue exhibited in the Archaeological Museum of Delphi. Many cafÃ©s and restaurants are located in the main street of Delphi and offer a stunning view over the valley. You’ll find traditional Greek and international cuisine with a variety of meat and/or vegetable plates and, occasionally, sea food. For all the conference participants who wish to enjoy their dinner at â€œTo Patriko Masâ€ a 10% discount on the daily menu and 5% discount on bottled wines is granted. This historic walled 11thÂ century monastery is situated in a scenic site on the slopes of Mount Helicon.It is one of the most important monuments of Middle Byzantine architecture and art and has been listed onÂ UNESCOâ€™s World Heritage Sites. The great octagonal church of Agios Loukas contains the tomb of the saint, though the bones have been sent to Rome. It also contains some of Greece’s finest Byzantine frescos and icons. Just 12 kilometers from Delphi this small town is a mountain village located at the foot of Mount Parnassus in altitude of 950 m. The visitors can walk around admiring the beautiful stone houses and water sources. Arachova, despite the high level of tourism development has retained its traditional character, while offering all modern touristic amenities and activities. The noble and picturesque Galaxidi is a 4,000 years old nautical city and which reached a peak during the 1821 Liberation War. Many invaders tried to conquer Galaxidi during its history, but the city resisted and nowadays it is one of the most attracting Greek resorts. In the 19th century it knew great prosperity from shipping. Today it is a delightful popular holiday spot both in summer and winter thanks to its well-preserved traditional architecture and its amenities for visitors. Our organisation partner Landfly Travel also offers a large selection of hotels in Athens for the delegates interested in visiting the city before or after the conference.